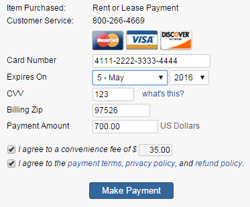 Give your tenants the option to pay rent online through automated ACH payments (electronic draft) or with a credit or debit card. Forget the hassle of receiving, processing, and depositing checks. No more tenant excuses about late payments either! ACH payments are commonly used by utility companies who allow customers to automatically pay their bills and by banks for doing auto-pay on loans and credit cards. Now you can make use of the exact same system used throughout the US with online payments built into Rentec Direct.